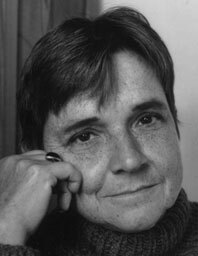 Widely read, widely anthologized, widely interviewed, and widely taught, Adrienne Rich (1929–2012) was for decades among the most influential writers of the feminist movement and one of the best-known American public intellectuals. She wrote two dozen volumes of poetry and more than a half-dozen of prose. Her constellation of honors includes two National Book Awards, a MacArthur Foundation “genius” grant, and a Medal for Distinguished Contribution to American Letters by the National Book Foundation. Ms. Rich’s volumes of poetry include The Dream of a Common Language, A Wild Patience Has Taken Me This Far, An Atlas of the Difficult World, The School Among the Ruins, and Telephone Ringing in the Labyrinth. Her prose includes the essay collections On Lies, Secrets, and Silence; Blood, Bread, and Poetry; an influential essay, “Compulsory Heterosexuality and Lesbian Existence,” and the nonfiction book Of Woman Born, which examines the institution of motherhood as a socio-historic construct. In 2010, she was honored with The Griffin Trust for Excellence in Poetry's Lifetime Recognition Award.